My name is Cory Baudoin and I was born and raised in south Louisiana. I am 41 years old and have been training retrievers for the past 21 years. 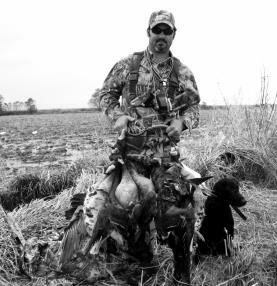 If there is one thing i pride myself on it is the fact that I am a hunter first and foremost and training retrievers allows me keep the hunting season going year round. It has also helped me get a good grasp on what a hunter expects from his retriever, allowing me to customize each dog for each hunter. I was lucky enough to have been born in the same town as a gentleman named Mr. Dudley Duhon who if you are familiar with the field trial world, is one of the most respected trainers in Louisiana. I was fortunate enough for Mr. Dudley to take me under his wing as a young trainer and teach me everything I know today. I have also made it my responsibiltiy to surrond myself with the right people to help me get to the place I want to be in the retriever training world. I enjoy nothing more than sitting on the tailgate of a truck and talking dogs all afternoon with someone who has a passion for them the way that I do . To me there is nothing more gratifying than taking a young dog and turning it into a true hunting partner that you can be proud of. I have dedicated myself to bringing the best out of each retriever I train and approach each one as if it were my own personnal dog. I take pride in putting the Old Cypress Kennel name on some of the best hunting dogs in south Louisiana and hope to continue to do so for many years to come. So come out and spend the day with us, we look forward to meeting many more of you in the years to come. Thank you.